On April 13, NHL clubs played the last games of the regular season. RBTH recaps the NHL Russian hockey players’ regular season. Varlamov was the most valuable goalkeeper of the season, if judged not only by statistics but also on the significant impact he had on the team's success. The 25-year-old Russian has 41 victory under his belt this season, distancing him from his closest counterparts, Marc-Andre Fleury of Pittsburgh and Antti Niemi of San Jose by 2 matches. Semyon managed to set a new Avalanche club record for the number of goalie wins in a single season, which had belonged to the current head coach Patrick Roy. Personal failures and a poor Olympics served as motivation for the native of Yaroslavl. Varlamov was the first goalkeeper from Russia, who finished the season the leader in the number of wins and saves. Unlike his star partner Sidney Crosby, who finished as the regular season’s top scorer, 27-year-old Malkin did not even make it into the top 10 of scorers. The reason for “Gino’s” scoring drought was injury. Several times this season Malkin was in tip-top shape, enjoyed a prolonged productive streak, was named one of the stars of the week/month, and then he would get injured in a freak accident and have to sit for long time on the disabled list. At the beginning of the season Malkin surprised everyone with two things - the low goal output and an unusually high percentage of face-offs won. As the season progressed, Malkin eventually regained his old form. Eugene scored more than 20 goals, but his accuracy indicators have fallen to 40%. Winner of the Vezina Troph (for the best goalkeeper of the NHL season) last year, Bobrovsky managed to stay on top of his game and once again was one of the best goalkeepers in the NHL. 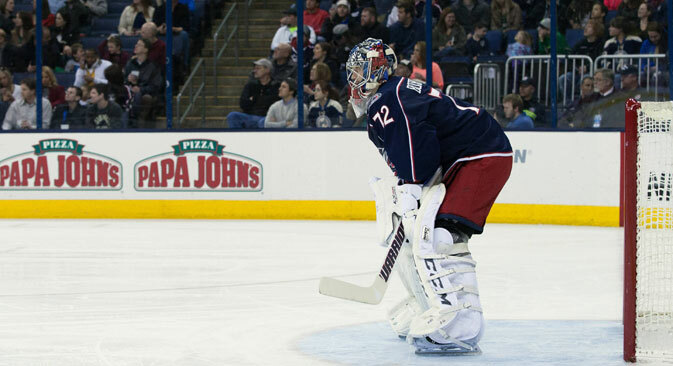 The 25 -year-old Bobrovsky entered into the top 10 league goalies in number of victories and save percentage Sergei also have five shutouts this season. The Russian’s most important achievement was to help secure the Blue Jackets’ second trip to the NHL playoffs in their history. In 2008/2009, the team exited the playoffs after the first round. In order to rewrite the history books, Bobrovsky will have to showcase all this skills to cope with the powerful attacks of Pittsburgh, led by Sidney Crosby and Evgeni Malkin. The 35-year-old Markov played in more than 80 matches mark for the second time in his career, which, after a series of operations on his knees, few expected. At the beginning of the season, Markov was playing like a contender for the Norris Trophy (the prize for the best defender of the regular season). At midseason, things got a little rougher, which was partially due to his partner Alexei Emelin’s being out of shape. He became the best on team in terms of efficiency rating and minutes per game, averaging 25:14. He made the top five in the league in blocked shots. If Markov doesn’t wither in the playoffs, he can dictate the terms of his next contract with Montreal. The 28-year-old captain of the Capitals finished the regular season as the league’s best scorer for the fourth time in his career, winning him the Maurice Richard Trophy. Ovie’s 51 goals were eight more than his main pursuer, Canadian Corey Perry, who plays for Anaheim. Alexander drew closer in career scoring to the best sniper in Capitals history, Peter Bondra (825 vs. 814) and will pass the Slovak early next regular season. In addition, Alexander set a new career worst in efficiency rating, but his team still managed to make the playoffs. No matter who will coach the Capitals next season, whether it be Adam Oates or anyone else, it won’t hurt the Russian striker to reflect on the effectiveness of his game at even strength. 1) The main disappointment of the year can be attributed to the second season of 20-year-old Edmonton striker Nail Yakupov. The young Russian, who was predicted to follow in the footsteps of Ovechkin, scored just 11 goals, with an efficiency rating of -33. 2) Although the New Jersey Devils were the best in the league in penalty killing, the season didn’t go so well for 32-year-old Anton Volchenkov. Despite playing over 56 games, he did not find the net once, and spent most of the time on the bench. 3) Nineteen-year-old Buffalo center Mikhail Grigorenko had a worse second season in his career overseas than the first. With just three points in 18 games, the Russian was sent down to the farm club by team management. 4) Twenty-three-year-old Florida defenseman Dmitry Kulikov has been in the NHL for five years, and this season was supposed to be the turning point for him. Many of the 2009 first-round picks chosen before and after Dmitry made significant strides this past year. Unfortunately, the same cannot be said about Kulikov, having only scored 8 goals and ending up with an efficiency rating of minus 26. 5) The best years of 38-year-old New York Islanders goalkeeper Evgeny Nabokov are already behind him. Despite the fact that he was able to get 5 shutouts and have a few weeks of impressive play, it is not enough to save his season. Nabokov ranked 42nd among all goalies in save percentage and 38th in efficiency rating. He will have to look for a new place of employment in the NHL after this season.